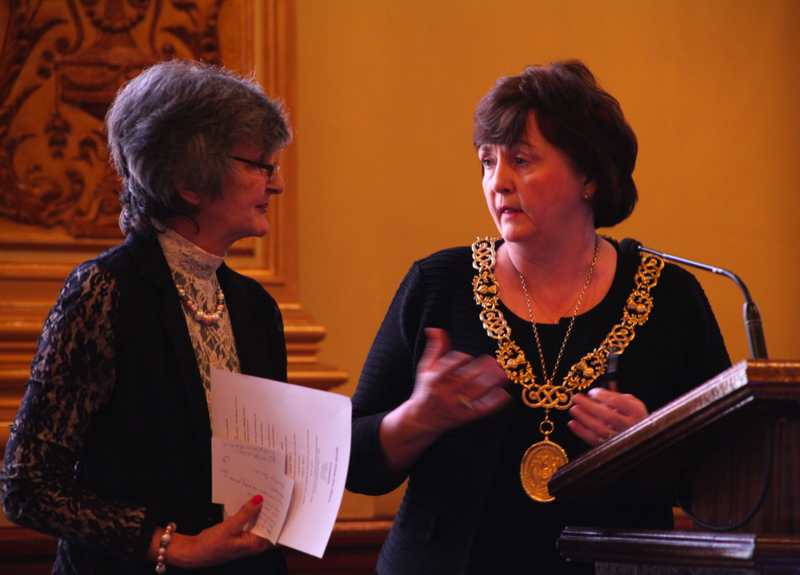 Scottish politicians and public figures join 100 Kinship Carers at City Chambers to celebrate launch of Scottish Kinship Care Alliance. 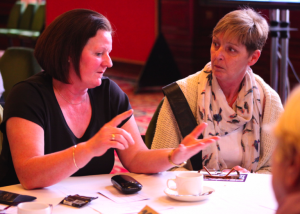 Buttle UK launch groundbreaking study on informal Kinship Care. Carers claim there is ‘institutionalised discrimination’ against their children in Scotland and demand to be included in policy making. 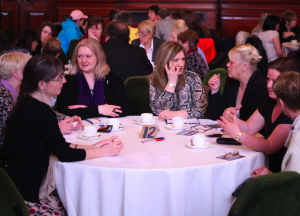 More than 100 Kinship Carers(1) from across Scotland(2) descended on Glasgow’s City Chambers today for the launch of their national Alliance which has been formed to campaign for the rights of the children in their care. The launch was attended by a range of MPs, MSPs, Councillors and civil servants as well as heads of Social Work, Police, and Scotland’s Human Rights Commission and Children’s Commission(3) and was hosted by the Lord Provost of Glasgow – Sadie Doherty. Please read on for a report of today’s high profile launch and links to the extensive press coverage (at the bottom of the post). See the video from the event here. This entry was posted in Event, Kinship Care, News, Protest and tagged Buttle UK, care, children, demonstration, discrimination, family foster care, foster care, Glasgow City Council, human rights, informal kinship care, kinship allowance, kinship care, policy, psychological services, Scotland, scottish government, Social Work on April 15, 2013 by Miriam Rose. The Scottish Kinship Care Alliance has submitted its first consultation response – to the Scottish Human Rights Commission’s consultation on the top Human Rights priorities for Scotland which they should include in a National Action Plan on Human Rights. 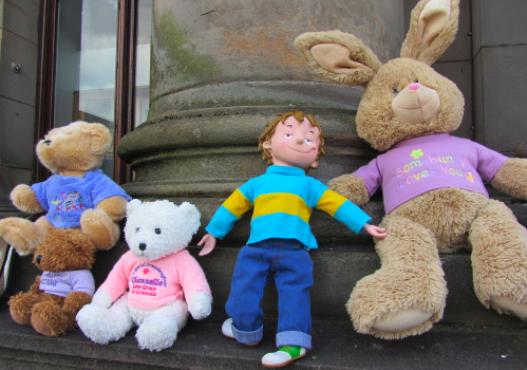 Our response focuses on the Human Rights issues affecting children in Kinship Care in Scotland. The full response is below. This entry was posted in Article, Kinship Care, News and tagged children, discrimination, human rights, informal kinship care, kinship allowance, kinship care, policy, psychological services, Scotland, scottish government, Social Work on April 8, 2013 by kinshipjustice. * Access to the proposed Order and allowances, support and benefits that should come with it must be available to non-looked after as well as looked-after children. Services and support must follow the child rather than the placement. (ie no matter what legal order the child is under they still get help if they need it). * Though there should be the option for more parental rights and less statutory involvement if that’s what the Kinship family want and the child is happy and settled, social work should remain as a support when needed for example with contact time with parents etc. * The proposed Kinship Order must come with a legal obligation to provide support to the child. This should include financial allowance, psychological and educational services and respite for the kinship carers. This entry was posted in Article, Kinship Care and tagged discrimination, kinship allowance, kinship care, policy, psychological services, scottish government on January 4, 2013 by kinshipjustice. New Children and Young People Bill proposes Kinship Order! The Scottish Government have launched a new Children and Young People bill which contains a section on Kinship Care. This could mean big and potentially very positive changes for children in Kinship Care and the carers, but the bill is still in early stages and it is not clear exactly how it will translate into policy and real support yet. You can see the full bill here . The Kinship section begins at para 149. It includes proposals to remove the complicated system of different legal orders currently in place, and the unjust differentiation between formal and informal kinship care which depends on the level of Social Work involvement in placing the child, and replace them with one Kinship Order. This would theoretically be available to all kinship carers but would require some assessment of need and suitability by the local authority. Groups across Glasgow will be feeding in to the consultation and we’ll be raising our concerns about how assessment and awarding of the order are carried out. If the bar is set too high many excellent and loving carers will be excluded. If it is set at a fair level there will be a large increase in demand from carers in need and we hope they will be ready for this and able to back it financially. This entry was posted in Uncategorized and tagged kinship care, policy, scottish government on July 31, 2012 by kinshipjustice. 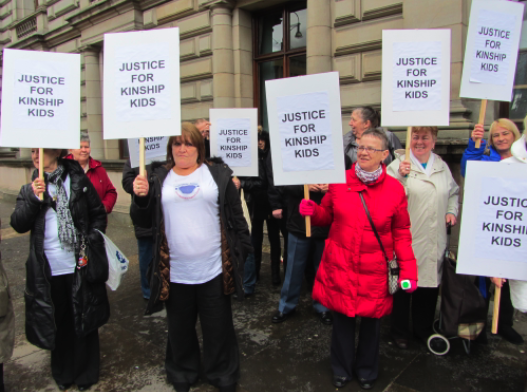 On Thursday 26th April Kinship Carers in Glasgow and Edinburgh demonstrated at Council Chambers demanding justice and asking council candidates to sign four pledges to support the vulnerable children in their care. See our press release below..
Kinship Carers demand justice outside Glasgow City Chambers, April 2012. 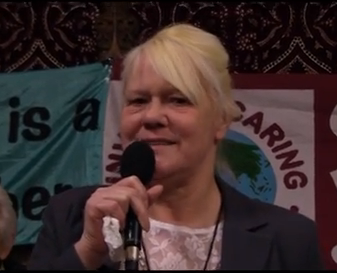 Kinship Carers demonstrate to demand that local election candidates agree to their national manifesto. 36 Council candidates from all main parties meet with carers in Glasgow and Edinburgh. 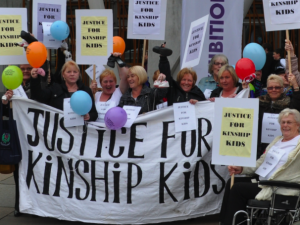 Basic support for vulnerable Kinship children still not in place after years of campaigning. Grandparents from across Scotland took to the streets today unperturbed by the rain, demanding that council election candidates from all parties sign a pledge to support vulnerable children living with non-parental family and friends. 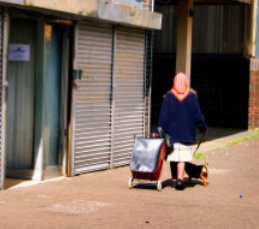 This entry was posted in Uncategorized and tagged demonstration, Glasgow City Council, kinship care, policy, scottish government on July 31, 2012 by kinshipjustice.